So you've got a cool/witty name for your band, a Soundcloud account, a 3D-printed Daft Punk helmet... so what could be missing from your road to stardom? The NeoTrellis M4, of course! 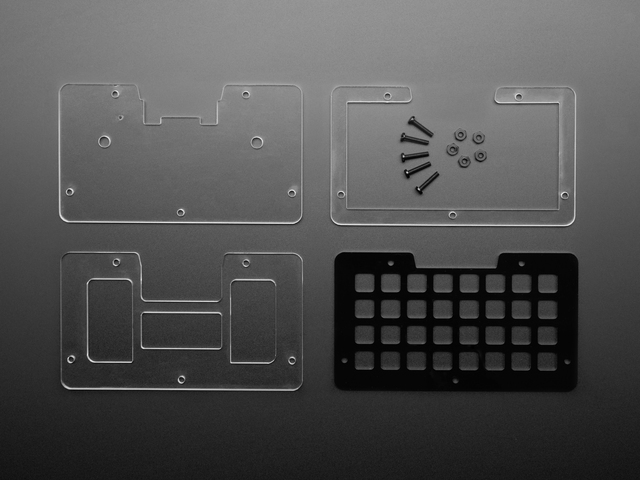 On the front side of the NeoTrellis is a 4x8 grid of NeoPixels and round gold inter-digit pads for elastomer buttons. You can use any NeoPixel library you like. Note that FastLED does not at the time of this writing, support the NeoTrellis M4. We do have a DMA NeoPixel library in Arduino that will take care of writes for you without processor time, and we recommend that! The buttons are set up in a 4 x 8 matrix, there are 4 rows and 8 columns. Each button has a back-stop diode so you can press any/all keys at the same time without any 'ghosting'. At the top of the board there's a micro USB port, used for debugging/uploading code and is a native USB devices so it can act as a true USB MIDI device if you like. At the time of this writing only Arduino support has USB MIDI but we hope to add it to CircuitPython as well. There is a 500mA fuse on the USB port which will throw when more than 1A is drawn, to protect any device you plug the NeoTrellis into. The SAMD51 has a dual DAC - that's two 12-bit, 500KSPS 'true analog' outputs and we connected them to left and right on a standard headphone jack. You're not going to get audiophile-quality outputs from two 12-bit DACs but you can certainly play audio clips and make beeps and bloops. 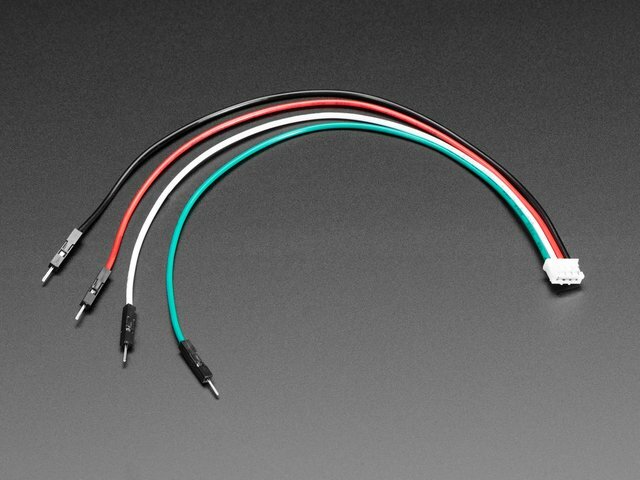 They are AC coupled with a 100uF capacitor, and have a small divider so that the output is about line level. Since the DAC pins are also ADC pins you could also use the left/right for audio line level input if you so choose. In that case, the same DAC channels can be used in ADC mode, the inputs are AC coupled and then biased to a 1.65V center. The left channel is on Arduino A1 or CircuitPython board.A1. The right channel is on Arduino A2 or CircuitPython board.A0. If you want to have some audio inputs, the 4th pin on the headphone jack is for microphone or line in. If you have a classic 'mobile phone headset', the electret mic will go through a MAX4466 electret amplifier with 100x gain into an ADC pin. Again, it's not audiophile quality (we're talking about an electret mic here) but you can do audio recording and filtering on the mono input. The raw un-amplified mic input is also connected to an ADC so you can read button presses on headsets that have a resistor-selector for their buttons, or some other 3.3V-max analog signal. In general, the DC bias will be about 2.5VDC when a microphone is plugged in. When pressed, the 'center' pause button on headsets will set the DC bias on this pin to ground. If you have an Android (not Apple) headset with up/down buttons as well, the bias shift to 1.7V and 0.9V (approximately) so you can detect those button presses. Apple headsets send digital chirps on the up/down buttons and we don't have code or hardware to decode those! 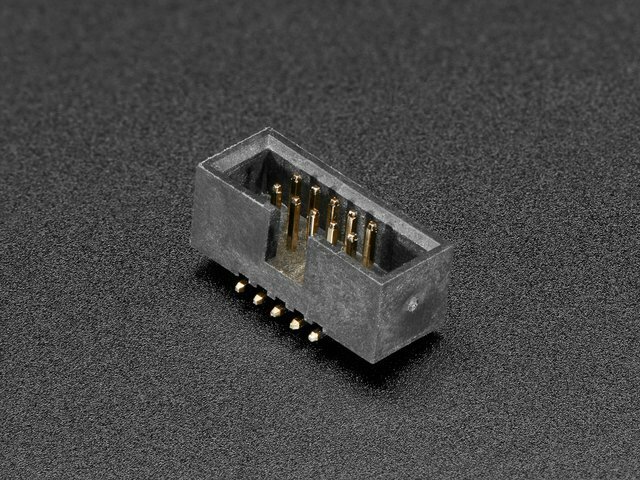 If you want to plug in some custom hardware, we make it easy with a 4 pin JST hacking port, available for extra add-ons. It's STEMMA and Grove compatible, and provides GND, 3.3V power, and two pins that can be used for I2C, ADC, or a UART. If you're using Arduino, the two GPIO are available on PIN_WIRE_SDA and PIN_WIRE_SCL for I2C usage, or A4 and A5 for analog reading. There's a small reset button on the back of the PCB, you can double-click it to enter the bootloader. OK now that you have Arduino IDE set up, drivers installed if necessary and you've practiced uploading code, you can start installing all the Libraries we'll be using to program it. There's a lot of libraries! This adds a special NeoPixel library that uses DMA so the NeoPixel stuff happens without processor time taken. This is used by the PJRC Audio Library you'll install later. This is also used by the PJRC Audio Library. Once you have the Arduino libraries installed you can try these examples! Load this example to turn on NeoPixels whenever you press a button. Press again to turn it off. Good for checking button presses, elastomers and NeoPixels. 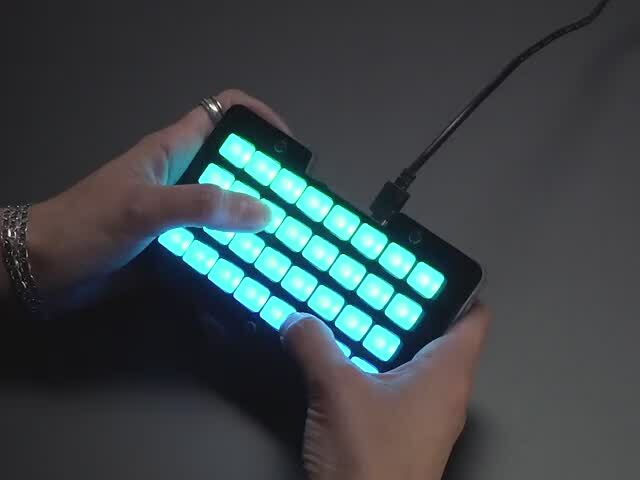 Your NeoTrellis M4 can act as a 32-button MIDI board. This example will send Note On and Note Off reports for every button when pressed and released. The Audio library (originally by PJRC) allows the creation of waveforms and filters dynamically by the chip! You can try this out with the simple synth example, which will give you an octave each of four different voices. The playback is polyphonic, try pressing multiple buttons! This example will take microphone input and then pipe it out the headphones. 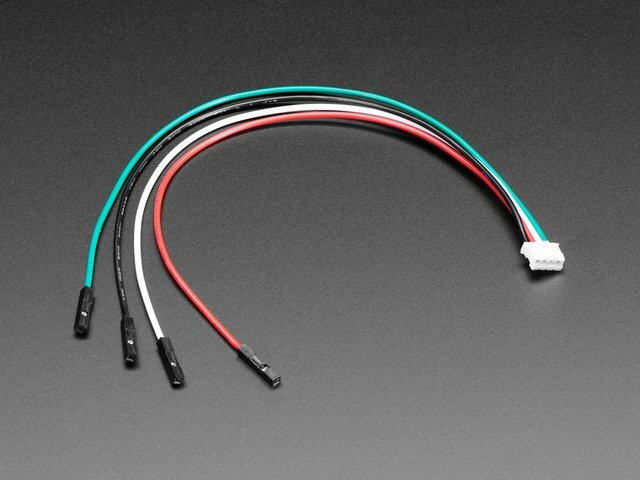 Simple but good for checking that your headset is wired correctly. You can take audio input, then display it on the LEDs - here's an FFT example. You don't get a lot of bins but it can make for a neat audio effect! CircuitPython is designed to simplify experimentation and education on low-cost microcontrollers. It makes it easier than ever to get prototyping by requiring no upfront desktop software downloads. Simply copy and edit files on the flash drive named CIRCUITPY which appears when NeoTrellis is plugged into a computer to iterate. Plug your NeoTrellis M4 Express into your computer using a known-good USB cable. Double-click the Reset button next to the USB connector on your board, and you will see the status DotStar RGB LED turn green. If it turns red, check the USB cable, try another USB port, etc. You will see a new flash disk drive appear called TRELM4BOOT. Drag the adafruit_circuitpython_etc.uf2 file to TRELM4BOOT. The LED will flash. Then, the TRELM4BOOT drive will disappear and a new disk drive called CIRCUITPY will appear. One of the best things about CircuitPython is how simple it is to get code up and running. In this section, we're going to cover how to load libraries, and create and edit your first CircuitPython program. The first thing you'll need to do is make sure you have the CircuitPython library bundle installed. Each CircuitPython program you run needs to have a lot of information to work. The reason CircuitPython is so simple to use is that most of that information is stored in other files and works in the background. These files are called libraries. Some of them are built into CircuitPython. Others are stored on your CIRCUITPY drive in a folder called lib. Part of what makes CircuitPython so awesome is its ability to store code separately from the firmware itself. Storing code separately from the firmware makes it easier to update both the code you write and the libraries you depend. Your board may ship with a lib folder already present. We're always updating and improving libraries, so it's best to download the latest version and replace the version that it shipped with! Click on the link below to go to the CircuitPython Library Bundle Releases page. Download the 4.x bundle. You always want to download the bundle that matches the version of CircuitPython you're using. Unzip the file you downloaded, open the folder, and then copy the lib folder to your CIRCUITPY drive. For a more detailed explanation, please see the CircuitPython Libraries page in this guide. That's all there is to installing the CircuitPython library bundle! The PyCharm IDE is safe if "Safe Write" is turned on in Settings->System Settings->Synchronization (on by default). To create your first program, create a file called code.py on your CIRCUITPY drive using your editor. Copy and paste the following code into your code.py file and save. The first NeoPixel will start blinking red! Use an editor that writes fully on save, like the editors suggested int the list above. Always eject or sync the after writing. On Windows, you can Eject or Safe Remove the CIRCUITPY drive. It won't actually eject, but it will force the operating system to save your file to disk. On Linux, use the sync command in a terminal to force the write to disk. Leave the rest of the code as-is. Save your file. See what happens to the NeoPixel on your board? Something changed! Do you know why? Let's find out! The import statements tells the board that you're going to use a particular library in your code. In this example, we imported two libraries: time and adafruit_trellism4. time let's you pass time by 'sleeping', and adafruit_trellism4 lets you interact with the buttons and NeoPixels on the front of your board. The next line sets up Trellis M4 library. We assign trellis to allow us to use the features of the Trellis M4 library in our code. First, we have trellis.pixels[0, 0] = (100, 0, 0). This line tells the first NeoPixel to turn on red. On the next line, we have time.sleep(0.5). This line is telling CircuitPython to pause running code for 0.5 seconds. Since this is between turning the NeoPixel red and off, the led will be on for 0.5 seconds. The next two lines are similar. trellis.pixels[0, 0] = (100, 0, 0) tells the NeoPixel to turn off, and time.sleep(0.5) tells CircuitPython to pause for another 0.5 seconds. This occurs between turning the NeoPixel off and back on so the NeoPixel will be off for 0.5 seconds too. So, when you changed the first 0.5 to 0.1, you decreased the amount of time that the code leaves the NeoPixel on. So it blinks on really quickly before turning off! Now it blinks really fast! You decreased the both time that the code leaves the NeoPixel on and off! Now try increasing both of the 0.1 to 1. Your NeoPixel will blink much more slowly because you've increased the amount of time that the NeoPixel is turned on and off. To connect to the serial output, you'll use the screen command. For a detailed explanation of how to connect to the serial console using screen, please see the Advanced Serial Console on Mac and Linux page in this guide. If you're using Windows, you'll need to download a terminal program. We suggest PuTTY. First, download the latest version of PuTTY. You'll want to download the Windows installer file. It is most likely that you'll need the 64-bit version. Download the file and install the program on your machine. If you run into issues, you can try downloading the 32-bit version instead. However, the 64-bit version will work on most PCs. You'll use PuTTY to connect to the serial output. For a detailed explanation of how to use PuTTY to connect to the serial console, please see the Advanced Serial Console on Windows page in this guide. Delete the ) at the end of (100, 0, 0) from the line trellis.pixels[0, 0] = (100, 0, 0) so that it says trellis.pixels[0, 0] = (100, 0, 0. The Traceback (most recent call last): is telling you that the last thing it was able to run was line 9 in your code. The next line is your error: SyntaxError: invalid syntax. This error might not mean a lot to you, but combined with knowing the issue is on line 9, it gives you a great place to start! Go back to your code, and take a look at line 9. Obviously, you know what the problem is already. But if you didn't, you'd want to look at line 9 and see if you could figure it out. If you're still unsure, try googling the error to get some help. In this case, you know what to look for. You removed a parenthesis. Fix the typo and save your file. Nice job fixing the error! Your serial console is streaming and your NeoPixel Is blinking red again. 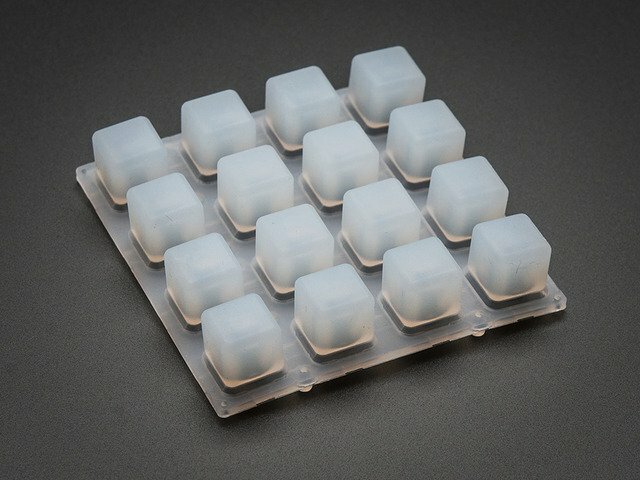 We've written a library that makes it super easy to use the buttons and NeoPixel LEDs on your NeoTrellis M4 Express board. It allows you to address both the buttons and the NeoPixels using coordinates (i.e. (0, 0)) so it's easy to know which button and NeoPixel you're working with. It also allows you to tell the code that you've rotated your board and then alters the coordinates to match the orientation. Let's take a look! First you need to make sure you've loaded the Adafruit CircuitPython TrelllisM4 library onto your board. Download the latest CircuitPython Library Bundle that corresponds to the version of Circuit Python you're using (as of this writing that would be 4.x), unzip the downloaded file, open the folder, and copy the lib folder found inside to your CIRCUITPY drive. Check out the CircuitPython Libraries page of this guide for a detailed explanation of how to load the library bundle on your board. rotation - Specify the orientation of your board in 90 degree increments. Default is 0. When rotation is not specified or rotation=0, the code assumes the board is oriented with the USB port facing away from you or pointing upward. Acceptable rotations are: 0, 90, 180, and 270.
pressed_keys - A list of tuples of currently pressed button coordinates. 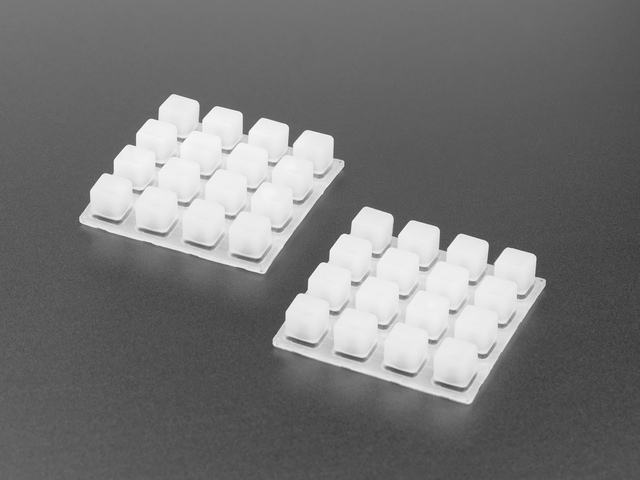 pixels - Provides a two-dimensional grid representation of the NeoPixels on the NeoTrellis M4. pixels.fill - Colors all the NeoPixels a given color. pixels.brightness - The overall brightness of the pixels. Must be a number between 0 and 1, which represents a percentage, i.e. 0.3 is 30%. pixels.width - The width of the NeoPixel grid. When rotation is 0 or 180, the width is 8. When rotation is 90 or 270, the width is 4.
pixels.height - The height of the NeoPixel grid. When rotation is 0 or 180, the height is 4. When rotation is 90 or 270, the height is 8. Let's take a look at a simple example. Copy the following code to the code.py file on your CIRCUITPY drive and save the file. Then connect to the serial console. Try pressing a button. The coordinates are printed to the serial output. Try pressing more than one button. It prints the coordinates of all buttons pressed at any given point in time. As you can see, pressed_keys returns a list (the outer brackets, i.e. ) of coordinate tuples (the sets of numbers in parentheses, i.e. (x, y)). This example is useful to test the buttons and give you an idea of what the coordinates are for each one. Now we'll explore the other features of this library using the NeoPixels found on your NeoTrellis M4 Express. Now Let's Rotate the Board! Copy the following code to the code.py file found on your CIRCUITPY drive and save it. With the board oriented with the USB port on the opposite side of the board from you, the top-left button will light up red. This is the default orientation and is considered to be a 0 degree rotation. The TrellisM4 library has the ability to specify four different orientations in 90 degree increments by setting rotation in the setup line equal to: 0, 90, 180, or 270. This allows you to rotate your board with ease to the position that works best for your project, without requiring complicated code to compensate. We do that for you! The coordinates of the buttons change with the rotation, so (0, 0) is always top-left. Let's look at some examples. Here we have told the code rotation=90. Again, the top-left button is red, without needing to change the rest of your code. Try rotating your board another 90 degrees clockwise, until the USB cord is pointing down or towards you, and updating your code so rotation=180. Same result. And another 90 degrees clockwise so the USB cord is pointing to the left, and update your code so rotation=270. Upper left is red! These examples show that (0, 0) will always be in the upper left corner if you orient the board to match the rotation you provide. However, we've only specified pixel (0, 0) in these examples, so the code continues to work at all rotations. What happens if you have all the pixel coordinates specified in your code and provide a different rotation? The rest of the available coordinates also update to match the rotation you specify on setup. Therefore, if your code uses specific coordinates for either the buttons or the NeoPixels, and you provide a new rotation and rotate your board, you may need to change your code. This is because the available coordinates are different for different rotations. For example, if you light up the NeoPixel at (7, 3) and then set rotation=90, your code will fail because that coordinate is not available at a 90 degree rotation. The images below show you what the coordinate grids look like at each possible rotation. Let's take a look. (0, 0) is always in the upper left corner and the rest of the grid follows standard positive (x, y) coordinates. So when the board is rotated 0 or 180 degrees, the board is oriented horizontally, and the lower right will be (7, 3). The top left is still (0, 0), but the bottom right is now (3, 7). So, remember, if you have specific coordinates for either the NeoPixels or the buttons in your code that are not available in the opposite orientation, and you provide a rotation for an opposite orientation, your code will error and stop running. This is important to keep in mind as a troubleshooting step if your code works in one orientation but fails if you rotate it 90 degrees in either direction. Width and Height Can Make Rainbows! This library provides a two-dimensional representation of the NeoPixel grid so you can use coordinates to address the different pixels. If you want to be able to iterate over the grid, you need to use the pixels.width and pixels.height properties. The following example uses pixels.width and pixels.height to spread a rainbow over all the NeoPixels. Copy the following code to your code.py file and save it. Rainbow! When you press a button, it lights up all the pixels to match the color of the button pressed and then returns to the rainbow layout when the button is released. It's an easy way to test whether your buttons are working without being connected to the serial console. We will be adding more features to this library. Check back for updates and make sure you're always using the latest version of the library! We've explained how to use the features in the Adafruit CircuitPython TrellisM4 library. Now we'll show how to use the library to write a CircuitPython program. In this section, you'll learn how to initialise the library for use in your code, and then use Python lists and sets to keep track of LED states and button presses. This program begins with all the NeoPixels turned off. You can then press the buttons to toggle the associated NeoPixels on and off in a rainbow pattern spread over all of the LEDs. This is how you'll begin any program that will be using the TrellisM4 library. You can include other libraries in your code by adding them after the import line and setting them up after the trellis line. Next, a helper function called wheel is defined. This code allows us to generate the rainbow pattern seen when you toggle all of the buttons on. For more information on how wheel is used, check out the Wheel Explained section here. With basic code, when you press a button, the button press gets sent over and over as long as you hold the button. This happens very quickly, too quickly for you to easily press it once and have the button press sent only once. Since we're trying to use the button as a toggle, we need it to respond only once until it is pressed again. So, we're going to use sets to keep track of which buttons have been pressed. A set is an unordered collection with no duplicate elements. Since we're not keeping track of the order in which we press the buttons, we don't care that it's unordered. Since a set eliminates duplicates, we don't have to worry about it including the same button press twice. You can use math on sets to do things including subtracting one set from another. Subtracting one set from another provides you with the elements in one set that are not in another. This allows you to determine the difference between the two sets. We will be comparing two sets. So sets are perfect for our needs! This code creates two sets and then compares them. This allows for us to keep track of the buttons currently being pressed and compare them to to the buttons previously pressed to determine what buttons have been released. First, we create an empty set called current_press. Then we begin our loop and create a set called pressed that contains all the buttons being pressed (trellis.pressed_keys) at the beginning of the loop. If no buttons are pressed, pressed will be empty. ...  # LED toggle code lives here. At the end of the loop, we set current_press = pressed so current_press contains all of the buttons currently pressed when the loop ends. Then, the loop begins again, and we check to see which buttons are being pressed by checking pressed. This means we now have two sets: one containing the buttons pressed when the loop ended, and one containing the buttons pressed when the loop begins. Now, we do some math so we can compare the two. press - current_press will provide a collection of buttons still being pressed, and we can now apply the LED toggle code to only those buttons! This example toggles the NeoPixels on or off when each button is pressed. Whether the pixel is turned on or off is dependent on the pixel's current state; if the pixel is on, the button press turns it off, and if the pixel is off, the button press turns it on. We need to track the current state of every pixel to be able to determine what state to toggle it to. For that, we're going to use a multidimensional list. A list is a collection of items that are both ordered and changeable. We want to use the (x, y) coordinates of the pixels to keep track of which pixel is which, so we want to keep all of the list entries in a particular order. We are going to be tracking two states for each pixel, so we need to be able to change each entry in the list to reflect the current state. Lists are exactly what we need! Since we are going to be using (x, y) coordinates of the pixels to determine which pixel we are addressing, we need to create a list that is a representation of the NeoPixel grid. For this, we need to create a multidimensional list, which is a list made up of lists. First we create the initial list and call it led_on. Then we create the multidimensional aspect of the list. We use append to add width number of empty lists to the initial list, and then we populate them with height number of entries, which we're setting to False because the LEDs are not on to begin with. As we initialised the Trellis without specifying a rotation value, width is equal to 8 and height is equal to 4. Let's take a look at the two parts of this section of code. Now we have our representation of the NeoPIxel grid and we can start toggling! We used five lines of code to create our list. It was easy to see what was happening in each section of code, and to explain how it was affecting the creation of our list. It turns out, however, that there's a way to do it in one line of code! List comprehensions provide a more concise way to create lists. They consist of brackets containing an expression followed by a for clause, potentially followed by further for or if clauses. As you can see, we used two for clauses in our list creation code. Our list comprehension consists of two for clauses as well. It does exactly the same thing as the code in the previous section: creates a multidimensional list made up of x lists, each containing y entries of False. And, it's much shorter. Handy! NeoPixels On: True or False? Now that we have our button presses tracked and our multidimensional list, we can easily toggle the NeoPixels. We're going to use the list to track whether they are on or off. Each time we press a button, we'll check to see whether it's associated list entry is True or False, If it's False, that means the LED is currently off. If it's True, it means the LED is currently on. Based on these results, that button press will change the list entry and turn the LED to the appropriate status. Let's take a look! press is already an x, y coordinate, but we need to have access to x and y separately. So, we first unpack press with x, y = press. We need access to x and y to use our list. Remember, we're using a multidimensional list containing x number of lists made up of y number. of entries. So, to access them, we'll use led_on[x][y]. Next, we have an if/else block. The if not led_on[x][y]: says if the led_on list entry found at [x][y] is False, run the code indented below it. The else says, "otherwise," which is to say, if the led_on list entry found at [x][y] is True, run the code indented below it. If the list entry is False when we press a button, we send a print statement, turn on the LED associated with that button to the rainbow color that matches it's location in the rainbow spread over all the buttons. Then, we set the list entry to True. If the list entry is True when we press a button, we send a print statement, turn the LED associated with that button off. Then, we set the list entry to False. You may have noticed that to address the pixels, we use trellis.pixels[x, y], but to address the list we use led_on[x][y]. This is because the NeoPixel code is specially designed to work with an [x, y] coordinate assignment. The multidimensional list, however, only works by addressing [x] and [y] separately. Whew! That's it! Now it's time to press, press, press! Here's the full program. Copy it to code.py on your NeoTrellis M4 and start toggling! Trellises now come with a locked (protected) bootloader so you do not need to perform this step if you have an ADABOX Trellis! On the very first batch of Neo Trellis M4 Express boards, the factory bootloader was not protected against accidental overwriting. Normally, the bootloader is unlikely to be damaged, but certain buggy programs and certain development environments might overwrite the bootloader. If you have one of these boards, we recommend you update the bootloader, which will protect it against overwriting as part of the updating process. To see if your board needs updating, double-click the reset button, and look at the INFO_UF2.TXT file in TRELM4BOOT. If the bootloader version listed is earlier than "UF2 Bootloader v2.0.0-adafruit.7", you may want to update. Download the bootloader updater below. Double-click the reset button and wait for the TRELM4BOOT drive to appear. Then drag or copy the updaterTRELM4BOOT. Wait for TRELM4BOOT to reappear. Your bootloader is now protected against overwriting. After updating, you'll need to reload CircuitPython or whatever other program was loaded on the board. Your CIRCUITPY drive is not affected by the updater on NeoTrellis M4 Express, because it's on a separate SPI flash chip. While playing audio back from the NeoTrellis M4 over the TRRS jack, I get an odd 'hissing' sound along with whatever is being played. Anything I should do to address this? If your NeoTrellis M4 is powered by your computer USB, first thing to try is decoupling any ground loops by using headphones or a powered speaker running from a battery pack. You may also want to try powering the NeoTrellis M4 over a USB battery pack instead of your computer. The 16-step sequencer 'sampler' demo where you can record audio onto the board depends on audio being stored in the flash memory, which is also where circuitpython stores files, so if you play one of the 'prerecorded' audio clips it will play files on the file system! You can solve this by loading CircuitPython back onto the board, then removing all the WAV files. Why does the NeoTrellis sometimes 'hiccup' and restart after a few seconds? Some computers, especially Mac's, will write a small amount of data after a few seconds, this causes CircuitPython to (correctly) reboot, and you'll get the audio re-start after a few seconds. After loading the 16-step sequencer, the MIDI arpeggiator or some other UF2 examples, my CIRCUITPY no longer appears! A few seconds/minutes after playing a sound on the NeoTrellis there's a 'peeeeeeeeeeewwwwwwwww' sound - what's that? When I press a button on the NeoTrellis a whole row is activated?